Neil Gaiman is a favorite author of mine. (ometimes his name is misspelled Gaiman or Gaimon, I’m just including the misspellings because I get a lot of mispelt(!) searches on this site. I get a ridiculous amount of searches for “Neil Gaimen” on my site, but it’s spelled “Neil Gaiman” (sometimes I get some for “Neil Gaimon” too). This post is really just to help point people to the proper postings. If you’re looking for stuff about Neil you can search this site for Neil Gaiman or posts tagged with Neil Gaiman. Speaking of Neil Gaiman, I’m planning to see Coraline in 3D today! “The Sandman Vol. 1: Preludes and Nocturnes”. “The Wolves in the Walls”. “The Day I Swapped My Dad for Two Goldfish”. Harper Collins books has a free audio book for download. You can download A Study in Emerald from Neil Gaiman’s Fragile Things (one story from a book of short stories). And it’s read by Neil too! Here is a direct link to the download (right-click to save). Who is the new Doctor Who for 2010? The funny thing is that The Doctor generally uses “John Smith” when he needs a “real” name for something in his travels so the matching name is fun (funny?). I don’t really know who he is which means I’ll have no preconceptions about him. I’ve seen him with Billie Piper (Rose from Doctor Who) in a Secret Diary of a Call Girl episode but I don’t really remember him. I originally read about it at Neil Gaiman’s blog and I completely agree with him in that he looks at home in front of the TARDIS and I’m sure he’ll look even more so as time goes one (especially since I’m sure they took many photos to get one that looked “right”). This is the Daily Mail article with the Matt Smith photo in front of the Tardis. He’s an article from The Guardian and the BBC article with a short video with Matt Smith. David Tennant’s last show is supposed to be in 2010 (after a weird four episode mini-season) so maybe they’ll make an interesting transition episode? it’s a 12 inch x 12 inch book ($20-ish on-line). While this seems slightly odd, I will need one for myself! They also have a Comic Book Tattoo Limited Edition Hard Cover for $149 $95! I’m not sure if that’s anything extra, like a larger format, nicer paper or autographed, if anyone hears anything, please let me know. Both editions have “coffee table format book” in their descriptions, but is 12×12 large enough for that format? Or is the hardcover edition larger? larger would be better…. So my philosophy in life is pretty much just to “be nice”. Maybe ‘karma’ and ‘what comes around, goes around’ and ‘do unto others as you want to them to do unto you’ want you to do the same thing (“be nice”) but they try to make you fear what might happen if you don’t. Really, they’re just slightly nicer versions of ‘an eye for an eye’ (the way most people interpret it). So maybe the above is an appropriate quote for this weekend, but it’s stuck with me for the last 20 years since I read it. It’s a pretty simple concept, be nice. all that confusing dying for our sins and betrayal really can confuse the whole simple concept. I’m not pushing religion or any deep philosophies. I’m not even trying to figure out why we decorate and eat hard boiled chicken embryos or chocolate shaped in their image. I’m just trying to get people to think about being a little nicer, if for no reason other than they can. I’ve been trying to filter out some of the “stuff” at my house that I don’t use any more, today was the clothes closet. Some stuff will be bound for Goodwill / Salvation Army, some for the trash and a few things for the vacation pile (clothes that I take on vacation but don’t bring back). Tori Amos (5): A few from concerts or that I found at a music store. I’ve got one that I got autographed at a concert. Indigo Girls (6): Mostly from concerts, something from an on-line group and an autographed one that a friend bought for me at an fund raising auction. Domestic Violence (7): I either purchased these at an event, they were given to me for volunteering at an event or came in a ‘thanks for donating’ package. Costa Rica (1): I’ve been there 4 times and only ended up with one shirt from my first trip (from one of the Zip Line through the Cloud Forest adventures). Blogography (3): Cool shirts that Dave from Blogography created. Sandman related (6): Shirts inspired from the Neil Gaiman Sandman series (I think they all have Dream, Death or Delerium or some combination of them). Tech Shirts (10+): Other tech shirts from vendors, tech conferences (part of registration or gift for presenting), organizations or something or another. My job (6+): Shirts that one of the departments printed up for work or some kind of fund raiser event. I so rarely wear them out (in both interpretations), I usually just wear plain (colored) shirts. If I’m changing into something to wear after I come home and shower I’ll throw one on but wearing one out and about just doesn’t happen so often. Actually, other that wearing a music one to a concert I think the only ones I’ve worn outside in the last year is probably wearing a few of the shirts that Dave made.FYI, the counts are just estimates, I didn’t actually make a tally sheet. Uh oh! I just bid a maximum of 50 dollars instead of 50 cents on an eBay item! I sure hope not many other people bid on this item. At first I freaked since I thought that was my bid, and then I remembered it’d bid up to that amount. There’s only a little bit of time left so cross your fingers for me! LATER: Whew! No one bid higher than the 50 cents!!! It was just for a Beowulf (Neil Gaiman and Roger Avery) movie tie-in advance six page comic that I thought might be interesting. This guy was charging a little more for shipping ($4) than the others so no one even beat my 50 cent bid…. A unique collaboration between a collection of talented musicians and a best-selling author. Seventeen top international acts offer 17 exclusive songs inspired by the diverse work of Neil Gaiman. Includes a lavish 20 page booklet with extensive liner notes from Neil Gaiman about the project and each of the songs and an assortment of all new artwork from Dave McKean, as well as a foreword by Gerard Way of My Chemical Romance. 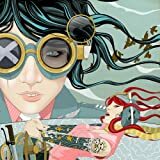 The songs on this disc are inspired by Gaiman stories including Coraline, American Gods, The Day I Swapped My Dad for Two Goldfish, Stardust, The Goldfish Pool, Sandman, The Wolves in the Walls, Mr. Punch, Mirror Mask and Neverwhere. Seriously, who ends up with something like that?!? How is he not getting more recognition on this? His stuff is kinda complicated and you’ve really got to pay attention, so don’t be afraid to start with the kid books, they’ve got all the cool art by Dave McKean too! So I’ve been excited since I originally saw the preview for Stardust a few months ago and I got to see a preview of the movie a few weeks ago (the movie is out now). I really enjoyed the movie and the cast was great (Claire Danes, Robert De Niro, Michelle Pfeiffer, Charlie Cox). They didn’t follow the book exactly and I have no problem with that, I’m re-reading the book and I’m finding that I really enjoy it after just seeing the movie. Claire Danes as the falling star was wonderful, technically she was a fallen star but that sounds like it has a negative connotations and she didn’t have any. From the previews I wasn’t sure how Claire would be in the part (I eel they edited the preview oddly) but I thought she was perfect. DeNiro played a different part than I expected from the previews; I guess it was a different role than I’ve ever seen him in before. Charlie Cox was great, I’m not sure where I’ve seen him before. They’ve finally got the preview for Stardust up. This is based on the Neil Gaiman book of the same name. I’m thinking they’ve taken some liberties but it’s been a while since I read the book so maybe not. This is what started me thinking about Neil Gaiman a few days ago, but the preview they had up at Yahoo didn’t seem as universally playable as this one at the official site so here you go to the official site. But back to the preview and check out this cast: Robert De Niro, Michele Pfeiffer, Claire Danes, Sienna Miller, Peter O’Toole, Ian McKellen (Narrator) and Charlie Cox (the main character). So there’s a raffle at the Open Rights Group and one of the items is the keyboard that Neil Gaiman used to write most of his Sandman stories. It’s missing a key, but it’s autographed and for some reason he doesn’t think this would be a very cool prize. This would be so cool to have! There’s lots of other prizes too (more from Neil too). If you don’t know who Neil Gaiman is, someone summed it up the other day (and I don’t remember who I found it, so now I don’t have to paraphrase it). Most geeks swear by him (Neil Gaiman). If Joss Whedon is their god, Gaiman is their Jesus. Actually, I’d rank Neil higher than Joss, but he’s definitely more of a parable/quote person (IMHO) so maybe the latter fits more. So back to the keyboard – However I wanted to display it I’d have to put a little tag on it that says something like, “This author writes stories that transcend reality as we know it, but still fits in with it. Don’t ask any more because it’s a really really long answer”. He’s one of the few people that I really enjoy that I haven’t pushed on people. You really need to read more than a bit of it to get someone to really get it and before that point most people give up. I’ve mentioned Neil Gaiman lots before but I’ve never really posted a lot. If I mention him on-line people either know him or they don’t and I’ve generally left it at that. But I think I’m going to change that.Back to talking about the books — The Sandman is too complicated to explain to most people. No one believes me that he’s got a story-line around a English kid, Timothy Hunter, with wizardly powers who is a better character and been around a lot longer than Harry Potter (The Books of Magic). Mirror Mask is kind of surreal/bizzaro to show to people. Anansi Boys and American Gods are great if you can get people to stick with it, but they’re a little long for people who don’t get it. I’ve got people to like some of the short stories and some of the Sandman one-shots but getting them past that is always hard. Honestly, the kids books are where I’ve gotten most people to read: The Day I swapped my Dad for Two Goldfish, Coraline, and The Wolves in the Walls. But Coraline is the story one (the chapter book) but people tend to shake they’re head at some of the bizarreness of it. He’s got connections to Tori Amos too, but that’s another story. Q1: Which is a bigger waste of time in your life… being stuck in traffic or being placed on hold during telephone calls? Which do you find more annoying? Probably being stuck in traffic for two reasons. I’m probably not getting anything done and now I’m probably late… On the phone on hold I can at least get other stuff done (if you want them to answer quick, just start brushing your teeth). Q2: The Federal Trade Commission (FTC) recently rejected a petition from a consumer group asking that product placements on TV be clearly labeled as such. The FTC said that the use of products by characters in fictional television shows or contestants on reality TV shows like American Idol or The Apprentice does not constitute an objective claim to the quality of the product being shown on screen. What do you think… have the lines become blurred on this one? Should television shows be barred from using overt product placements, or should they at least be made to disclose these sorts of practices before, during, or after (in the credits) the shows in question? Reject away. Sheep People can decide for themselves or choose not to watch. Q3: With just about every business under the sun now accepting bank check cards and debit cards, do you find that you carry more, less, or the same amount of cash as you did 5 or 10 years ago? I’ve never been a big cash person. I charge just about everything. It really gives me some thought at the end of the month when I can see how much I spent and where… That’s the best way to curb my spending. Q4: What’s the last song you downloaded from the Internet? If you’ve never downloaded music, what’s the last CD you bought at a store or received as a gift? Technically it’s not a song, but the last thing I downloaded was The Neil Gaiman Audio Collection (The Day I Swapped my Dad for Two Goldfish, Wolves in the Walls, Cinnamon and Crazy Hair) which I bought from the iTunes store. The last song I bought was probably Breathe (2 AM) by Anna Nalick; I’m sure I’ve downloaded other songs from the itunes store but they’d be the free song of the week so I’m not really counting those. FYI – I tried to pick blogs if they came up. If they hadn’t posted in months and I had another option, I picked that. If not I picked the closest interesting one that’d I’d recommend. Nothing (boring). It’s usually just distracting for me. I’ll set it after/during a vacation. The last was London. Without looking, I’d say Drew Barrymore (Boys on the Side/Ever After). Now that I look I’d have to add Keanu Reeves (3 Matrix) and Liv Tyler (Armageddon/Stealing Beauty). My collection is pretty diverse. Unless it’s music I usually don’t buy DVDs, unless it’s a really good deal. Tori, Indigo Girls and Sarah McLachlan (they probably are who I have the most DVDs of too). Found at The Daily Meme. *In a story Neil has a Cereal Convention which is really a Serial (Killer) Convention. Neil Gaiman? Peter David? Jonathan Kellerman? Patricia Cornwell? Sarah who is definitely a SassyPants and Melissa who is Anything but Ordinary. http://GarySaid.com/tags/neil-gaiman/ generated Friday, April 19th 2019 at 2:40:50 pm EDT (in 163 queries in 0.766 seconds).